In addition to CritCases 1, I have also re-reviewed Dr. Weingart’s EMCrit post, Podcast 98 – Cyclic (Tricyclic) Antidepressant Overdose [Link is to the podcast and show notes]; May 14, 2013 by Scott Weingart. [Note to myself: Review the EMCrit 98 show notes along with the notes from this post. CritCases 1: Massive TCA Overdose [Link is to the blog post] from Emergency Medicine Cases is an outstanding guide to the recognition and management of tricyclic antidepressant overdose. Written by Michael Misch; Edited by Anton Helman; Expert Peer Review by Margaret Thompson, Medical Director of the Ontario Poison Control Centre and Vice President of the Canadian Association of Poison Control Centres. January 2016. A 51-year old male presents to Janus General, a rural ED about 100 km from the nearest tertiary care centre. Five hours prior to presentation he ingested approximately 60 tablets of amitryptilline (50 mg tablets). Upon arrival in the ED he is confused and combative. Initial vital signs are BP 55/30 to 93/60, HR 135, RR 24, Temperature 37.4. Capillary glucose is normal. ECG is shown below. What’s your interpretation of the this ECG? Is it typical for Massive TCA Overdose? The combination of these ECG findings is highly suspicious for a Sodium Chanel Blocker overdose, of which TCA is a classic example. His systolic blood pressure remains 50-80 mmHg. The QRS intermittently widens to greater than 160 ms and looks like ventricular tachycardia with repeated boluses of sodium bicarbonate causing transient narrowing of the QRS. Norepinephrine* is started and rapidly titrated up to 0.4 mcg/kg/minute. The patient becomes increasingly agitated, requiring multiple doses of IV midazolam. 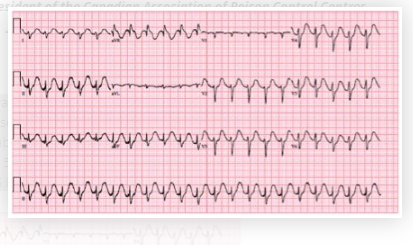 He subsequently becomes unresponsive with a GCS of 3. Care has been transferred to the transport team and the patient is en route by helicopter to the tertiary care centre, approximately 30 minutes away. The patient has already received 200 mEq of sodium bicarbonate. How much sodium bicarbonate is too much? Should you give more bicarbonate or move on to other therapeutic options for Massive TCA Overdose? The evidence for sodium bicarbonate in TCA overdose consists largely of case reports and animal studies. However, the largest cohort study of TCA overdose used a max pH of 7.55 and most clinicians will target a pH of 7.50-7.55. Additionally, a serum sodium of 150-155 mmol/L is often cited as the upper limit for sodium bicarbonate use. Aside from these parameters there does not seem to be a predefined maximum dose. The regimen used in this case is commonly seen in practice: 100-150 mEq of sodium bicarbonate given IV push followed by 100-150 mEq in 1000 ml of D5W at 250 ml/hour. It is important to monitor electrolytes and blood gases, (some would suggest hourly) particularly looking for hypokalemia and alkalosis. A reasonable approach would be to give sodium bicarbonate as above, check your electrolytes and a blood gas. If you’ve reach a pH of 7.5-7.55 or a Na of 150-155 mmol/L then it is likely time to move on to your next option. This case was tweeted out twice and garnered 3,306 impressions and 720 engagements. Many clinicians including EM physicians, toxicologists and critical care physicians voiced their opinions and many said that they would give more bicarb after 200mEq had been given without significant clinical or ECG improvement. However, David Juurlink (@DavidJuurlink) suggested that after 4 amps of bicarb with no clinical improvement, it was time to move on to other therapies. Are you going to give intralipid now? Do you have it stocked in your ED? While most evidence for use of intralipid (20% lipid emulsion) in poisoned patients is based on local anesthetic toxicity, it’s use should be considered for any lipophilic, cardiotoxic drug for which supportive therapies have failed. Intralipid is essentially TPN and is thought to act as a “lipid sink” that effectively reduces the level of free TCA in the blood. Intralipid has been studied for TCA overdose in animal models and described in several case reports. There is a well-described protocol at lipidrescue.org, which can be used as a point-of-care resource if need be. However, this is an opportune time to contact your local poison control centre to speak to an expert toxicologist to help guide management, if the situation permits. Intralipid is given as an initial bolus of 1.5 ml/kg (approximately 100 cc) over one minute followed by 0.25 ml/kg/hour, to a maximum dose of 12mL/kg. Given the increasing use of intralipid as a rescue antidote for several cardiotoxic medications including calcium channel blockers and beta-blockers, it is important to know whether it is stocked in your ED or not. In this scenario the patient was already en route via helicopter where intralipid was not available, and so intralipid was not an option until arrival at the tertiary care centre. Some EMS services in Canada do carry intralipid. And the following is from Dr. Weingart’s excellent Podcast 98 – Cyclic (Tricyclic) Antidepressant Overdose; May 14, 2013 by Dr. Scott Weingart.